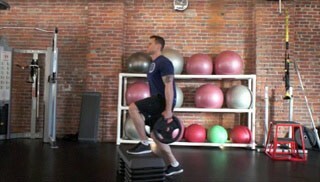 The weight plate step-up with knee drive is an intermediate lower body exercise. This is a challenging exercise that requires balance and coordination and helps build strength and improve core stability. 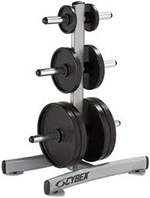 Start with one foot up on the step and hold a weight plate or dumbbell in each hand. Keep your back straight, your chin parallel to the floor and pull through your heel to lift your self up onto the step. Drive your knee at the top of the motion then lower your body back down to the starting position keeping complete control the entire time.